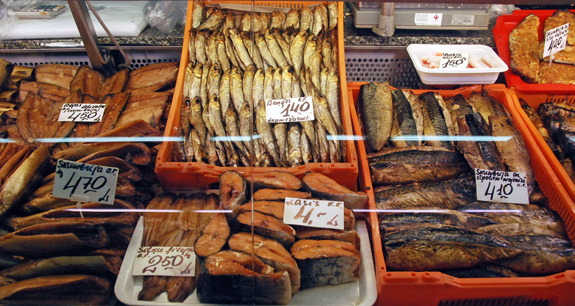 Kippered salmon is traditionally prepared using a hot-smoking process, resulting in a flaky, juicy piece of fish similar to baked salmon, but with a smoky flavor. Here I propose a more urban version. As I don’t have a smoker, I am using smoked salt to brine the salmon instead. The slow cooking then keeps the salmon moist and avoids an excess of coagulated white proteins on the outside. Make sure to choose a salt with a strong smoked flavor, not just a hint of smoke. I use the Yakima applewood smoked salt by Artisan Salt Co., but there are many other brands. Process the water, smoked salt, sugar and peppercorns in a blender until the salt is dissolved. In a dish just large enough for the salmon, pour some of the brine, then place the fillet skin side down, and cover with the rest of the brine. Cover and refrigerate for 8 hours. Drain the fillet, pat dry and refrigerate uncovered for another 6 hours to further dry. Take the fish from the refrigerator, and let rest at room temperature for 1 hour. Place the salmon fillet in a baking pan, and place that baking pan in a larger one that you fill with water. Cook in a 200 F oven for 2 hours, then let cool. Wipe off some of the coagulated white proteins with paper towels, and refrigerate. This should be served cool but not too cold, so you can take it out of the refrigerator about 30 minutes ahead. I want to make this and was wondering if the water bath is meaning that you cook in oven over a pan with water in it ? Alot of people are using these flavored salts now , I used to cheat and use liquid smoke and smoked paprika, but will try using the salt this time. I also saw an interesting recipe that used a big block of salt to cook the fish on top of , which sounded interesting. You’re right, I should have given more explanations. 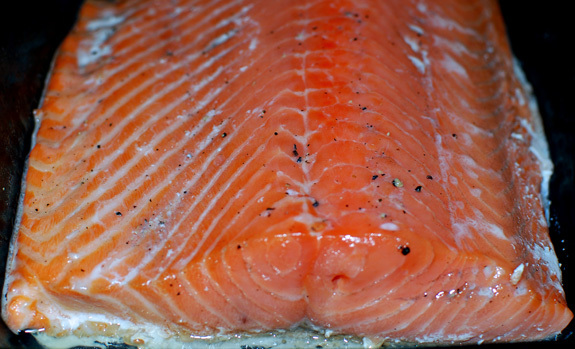 Place the salmon fillet in a baking pan, and place that baking pan in a larger one that you fill with water. Thanks Florian, that’s what I thought, but maybe someone younger may not have figured it out , thanks again. Is it possible to leave out the sugar in this recipe? I was wondering if it served the same purpose as xylitol in the lamb recipe. Just need to get smoked salt. Shouldn’t be too difficult.